It has been a non-stop yet productive and fun day. I have been helping my friend get all set up with her Crawfish Boil over the past couple of days. I was able to fit my workout in this morning before we really needed to have everything all set and the guests arrived. Today’s workout was Core Cardio and Balance. I feel as if it was another recovery day which I don’t mind at all. My friend’s daughter actually tried out the first 10 minutes of the workout so I sort of had a workout buddy for a little bit. My cold is lingering but it’s almost gone which did not give me a problem during my workout. Following my workout, we got everything ready and had a fun cookout. I enjoyed a bit but I didn’t go too crazy. I’m sure with the things I’ve done today along with my workout, I still was able to burn more calories than what I took in. The only thing I didn’t pay too much attention to was drinking enough water today. I normally drink at least 10-12 glasses a day and I think I only had half of that amount. Anyways, I’m exhausted and I’m definitely looking forward to a day off tomorrow! 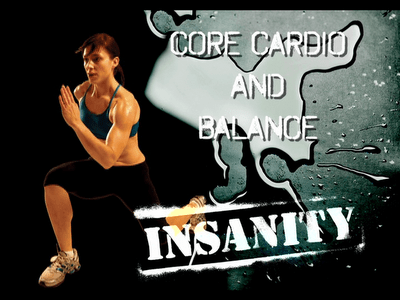 After that, one more week of my first round of Insanity! I think my days are getting busier and busier and I know I’ll be super busy this summer. I made sure I worked out before I went to lunch and work today. Today was Max Interval Circuit. I’m still sick but I pushed myself as hard as I could. My cough started to act up throughout the workout so I had to take it easy a few times. I still had a great workout and I loved how I was able to get my workout done early in the day. One more workout for this week tomorrow and then a rest day! Have a great weekend! I had a busy but great day today. I started the day of course weighing myself to find that I had lost another pound. 17 pounds total since February 6th! I’m getting closer and closer to hitting my goal of losing at least 20 pounds by the time I finish my first round of Insanity. I’m also getting closer to feeling better from my cold and I’m feeling stronger. I’m able to push myself a little harder and I want to get back to the level of intensity I was at before I got sick. It’s been a little over a week since I lost another pound and I’m happy to report that I lost yet another one this morning! I have lost 16 pounds since 2/6/12! There are less than 2 weeks left to my first round of Insanity and I’m shooting to lose at least 20 pounds by the end. I think it’s definitely achievable. I just need to stay focused and keep working hard. Well I woke up with a cough this morning. I was afraid I would get that and have chest congestion. Chest congestion could make it a little harder while working out so I decided to hold off on doing my workout until later at night. In the meantime, I helped my friend paint the walls in her hallway. That was a workout in itself and I’m sure I burned a bunch of calories painting. Before I painted, I drank my Shakeology for a late lunch and had another shake after I was done painting for dinner. I added Kale in the shake I had for lunch and added a scoop of Natural Peanut Butter and a small handful of roasted and unsalted peanuts in the shake I had for dinner. It’s not a lot of calories but I felt like I ate enough because it makes me feel full. On top of that I got the nutrients I needed and then some. I worked out to Max Cardio Conditioning and Cardio Abs as soon as I got home. Throughout my workouts, I modified and took it easier once again. A couple times, I was a little bit more out of breath and my lungs burned a bit due to the chest congestion. It sounds bad but it really isn’t. I made sure I took those breaks when I needed to. My cold is running it’s course a lot faster than the last time I was sick so I’m sure I’ll feel better by the weekend. Can’t wait for recovery day tomorrow! I watched this inspiring documentary called “Hungry For Change” last night. It exposes shocking secrets the diet, weight loss, and food industry don’t want you to know about. It is a shame what food companies do to foods to make them look more appealing and to make them taste better by using chemicals. There are some things I already knew from the film and there are some things I did not know. There is one important part that I knew which was eating foods that are high in nutrients. It’s always about nutrients over calories. The way that most of our society eats these days is the reason I have changed my major to Health and Fitness. I want to help spread the facts about what diets and processed foods can do to someone’s body. Most importantly, I want to help others change their lifestyles by the way they eat. Whether someone wants to eat healthy to lose weight or just to prevent diseases and in turn live longer, I will help them. I even got my Mom to start watching the film and she dumped out the rest of my Dad’s Diet Coke after she learned about how bad is for you. Even that is a great start. If you have children, watch this with them. As a kid growing up, I did not know how to eat healthy. Sure we had health classes but they were boring so I did not pay attention. I also followed what my parents ate and it did not help that my family is Filipino. We pretty much followed the “Asian Diet”. What I mean by “Asian Diet” are foods with lots of salt, sugar, fat, and starches. Damn that white rice! Anyways, I think it’s mandatory not to only watch this film with children but to also teach them on nutrition. Make it more interesting and interactive so a kid like me growing up will pay attention and understand. They don’t have to eat fruits and vegetables plain. There are tons of recipes that make them look appetizing, delicious, and at the same time they get the nutrients they need. I included the trailer below. You can watch the entire film online for free until March 31st. Just go to http://hungryforchange.tv/online-premiere. The film is 90 minutes long so I would find some time out of your day to watch it. It is definitely a must see film and it might change your life! I highly recommend sharing it with others too! The USDA recommends at least 5-9 servings of fruits and vegetables daily. It could be a little hard to eat all 9 servings in one day. In the film, they have a section on juicing fruits and vegetables so you can get your recommended servings. I think it’s great to do a cleanse for a few days to help reboot your system but I don’t think I would do it long term. Once you start getting used to eating fruits and vegetables again, it won’t be a problem eating it. Personally, I would drink Shakeology over juicing any day. It is not your average meal replacement shake. It has over 70 natural and high quality ingredients including high-quality antioxidants, 23 vitamins and minerals, super green phytonutrients, whey protein and essential amino acids, prebiotics and digestive enzymes, good carbs, and low fats. One shake is equivalent to more than 12 servings of fruits and vegetables. On top of that, it tastes great (you can blend almost anything in it), is wonderful on the go, gives you energy, and it fills you up. Yes, I do in fact promote Shakeology but before I started promoting it I was a user first. I love it myself and I would not be promoting something that I do not believe in. I consider it as my cheat meal of the day because it tastes too good to be healthy. If you are interested in Shakeology, check out the video below and email me. The thing that I was the most worried about has happened. I am sick once again. It’s weird because I eat healthy and drink Shakeology everyday. It’s even more weird that my friend, her 11-month year old daughter, and another friend that I went to Wisconsin Dells with got sick at the same time. We have almost the same symptoms. Maybe it’s from being very exhausted on Saturday or from coming in contact with a lot of people at the indoor water park and indoor/outdoor theme parks. For me, I think it’s a combination of both and my allergies acting up. Regardless, it stinks being sick. I did not leave my house at all today and I made sure I drank plenty of fluids and got some rest. I also kept to my healthy eating as well. I watched a documentary today called “Hungry For Change”. I learn more and more everyday about nutrition and I learned more things when I watched this film. I will post a little more about it in a separate post. Onto my workout! I have had pressure in my head which has been giving me a small headache today due to my stuffy nose. I kept debating whether I should workout or not. I have a head cold and I know it won’t affect me while working out. There are only 2 weeks left to my first round of Insanity and I did not want to take a day off. I know it’s bad and I’m a stubborn person but I’m not letting that stop me. I went ahead and worked out. It was definitely a challenge to get through Max Interval Plyo. I took it easier and modified and it felt like I still had a great workout. I’m hoping I’ll feel much better tomorrow! My pick for the inspirational/motivational song of the week is “Paradise” by Coldplay. I picked this song because it has a simple message. The song says to me how life gets harder when we grow up making it difficult to meet the challenges which we though could easily be met before. Despite the tough times, there is a dawn after every dusk. We all live on hope and faith in the end. Always have hope and never give up.